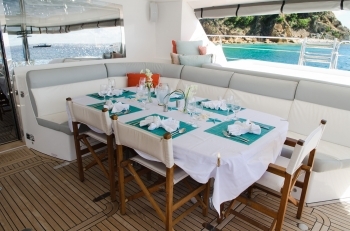 The 74′ Privilege catamaran XENIA has all new linen and typical, Privilege, nautical wood panelling below. 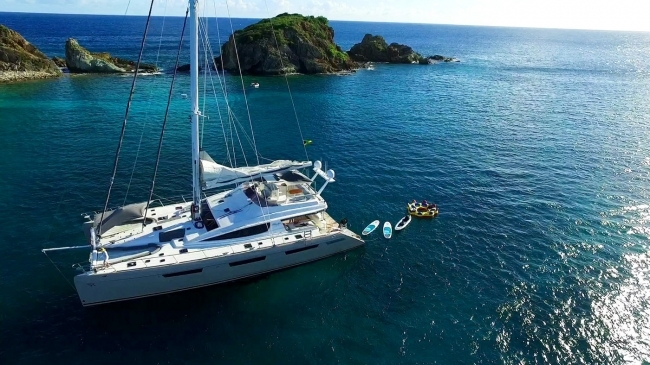 Available this summer in the Grenadine Islands, she and her fabulous crew are ready to go! 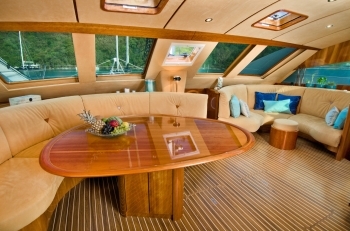 XENIA’s guests’ favorite place to gather after the yacht anchors is forward on the bow. Bolsters on the trampolines make comfortable sunbathing, or awnings can be put up for shade. Guest-controlled iPods operate speakers from the spreaders, and Jessie the stewardess brings you drinks and snacks. 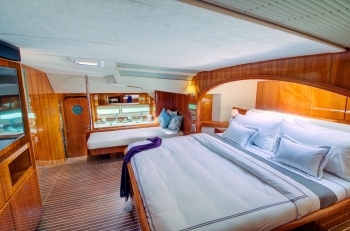 The yacht’s deluxe guest cabins offer a plethora of luxurious amenities. 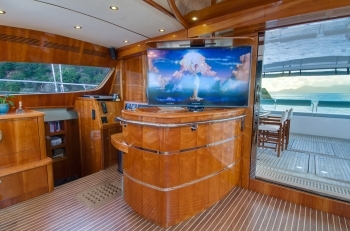 Glass bowl sinks, stall showers with seats, surfboard jet showers, all cabins have ensuite bathroom, Satellite TV and movies database. 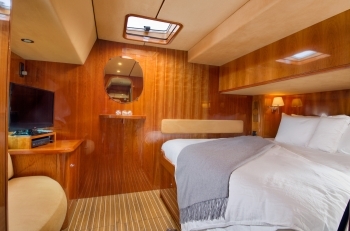 Thirty six feet wide, the master stateroom has King-size berth, in-room tub, double bowl sinks, 60″ Satellite TV, and lots of shining varnish work that contrasts with the cream-colored, leather ceiling liner. Three additional guest staterooms offer equal accommodations and have extra wide, European-size, Queen berths. 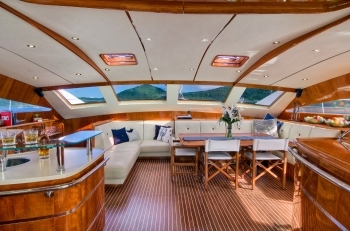 With galley located below in the pontoon to starboard, XENIA’s saloon is dedicated wholly to guests comfort. 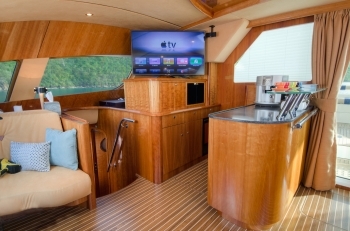 Featuring a 60″ Satellite TV, coffee bar, and drinks bar, the crew set up the coffee bar to offer all day and let guests decide where they would like to eat, whether inside in the saloon, outside in the covered cockpit, or upstairs on the fly deck, which has two varnished dining tables, retractable shade awnings, main sail covers, bar, fridge, and ice maker. 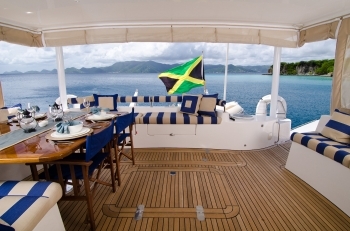 Deck chairs on the aft deck are great for fishing, while the captain is barbecuing. Operating with three crew, Gareth Wood, the captain from South Africa, is assisted by Kristina the chef, who is his wife, and Jessica, the first mate, who doubles as the chief stewardess.